In this photo provided by Glen Hunter, damage from Super Typhoon Yutu is shown outside Hunter's home in Saipan, Commonwealth of the Northern Mariana Islands, Thursday, Oct. 25, 2018. As the powerful storm crossed over the island the walls shook in Hunter's concrete home, a tin roof over the garage blew away and howling winds terrified his cats. Maximum sustained winds of 180 mph (290 kph) were recorded around the eye of the storm, which passed over Tinian and Saipan early Thursday local time, the National Weather Service said. The strongest storm to hit any part of the United States this year crumbled concrete houses, smashed cars and killed at least one person in the Northern Mariana Islands, shocking residents and officials used to riding out monster storms in the U.S. territory in the Pacific. A day after Super Typhoon Yutu slammed into the territory home to 50,000 people, residents on Friday picked through destruction ranging from collapsed houses — including some built to withstand typhoon winds — to snapped utility poles blocking waterlogged roads. They braced for months without power or running water. Maximum sustained winds of 180 mph (290 kph) were recorded around the eye of the storm, which passed over the islands of Tinian and Saipan early Thursday, the National Weather Service said. A 44-year-old woman taking shelter in an abandoned building died when it collapsed in the storm, the governor's office Facebook page said. Officials couldn't immediately be reached for additional details. The territory's only hospital in Saipan, the most populated island, said it received 133 people in the emergency room Thursday, and three patients had severe injuries that needed surgery. Officials toured villages in Saipan and saw cars crushed under a collapsed garage, the ground ripped clean of vegetation and some people injured by spraying glass and other debris. But residents "were stoic and still smiling and they were just thankful to be alive," said Edwin Propst, a member of the territory's House of Representatives. 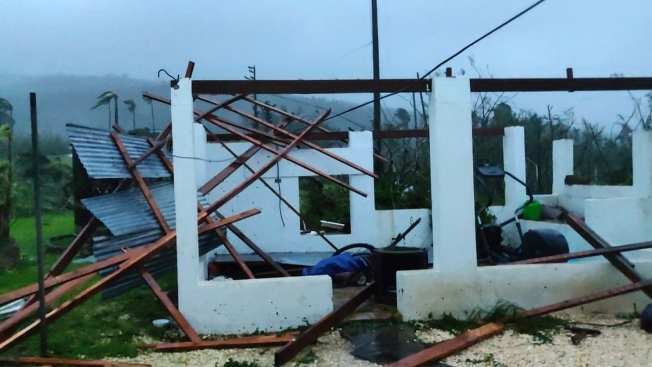 Gregorio Kilili Camacho Sablan, the islands' delegate to Congress, said most of the structures in the southern part of Saipan lost their roofs and many, including a high school, were "completely destroyed." "This damage is just horrendous, it's going to take months and months for us to recover," he said by phone. Even the plants were torn up, he said: "There are no shrubs, they're all gone. There are no leaves." On the smaller island of Tinian, which took a direct hit, most of the houses were destroyed, even some concrete ones reduced to rubble, resident Juanita Mendiola said. "We had to hide inside the bathroom because the house felt like it was going to blow apart," she said. "It was literally shaking — a concrete house shaking." More than 800 people were in shelters across the territory and space was running out, officials said. Electricity and running water shut down Wednesday, residents said. Cellphone coverage was spotty. The Saipan hospital was running on backup generators but otherwise operating normally, said Esther Lizama Muna, CEO of the Commonwealth Healthcare Corp. She said she expects more patients to seek medical help Friday and worried they could run out of medical supplies. 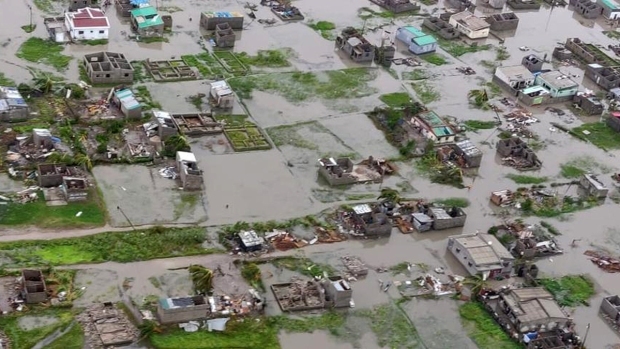 "From my experience with previous typhoons, people tend to wait to care for their health as they focus on their homes and others," Muna said. "So we do expect more injuries trickling in." A health center on Tinian sustained damage but was operating normally. The islands' emergency management agency said it was trying to clear roadways so first responders could help residents who lost their homes and people could get medical care and head to shelters. "At its peak, it felt like many trains running constant," Saipan resident Glen Hunter wrote in a Facebook message. "At its peak, the wind was constant and the sound horrifying." Hunter peeked outside and saw his neighbor's house, made of wood and tin, completely gone. The 45-year-old has lived on Saipan since childhood and is accustomed to strong storms but said Super Typhoon Yutu is the worst he has experienced. Hunter said he doesn't expect to get power back for months, recalling how it took four months to restore electricity after Typhoon Soudelor in 2015. "I have never seen anything like this in my life, and I have been through major typhoons," said Sablan, the congressional delegate. He said the territory will need significant help to recover and that colleagues in Congress have offered aid. Sablan expects a presidential disaster declaration to free up resources for storm relief. Recovery efforts on Saipan and Tinian will be slow, said Brandon Aydlett, a meteorologist with the National Weather Service. "This is the worst-case scenario. This is why the building codes in the Marianas are so tough," he said. "This is going to be the storm which sets the scale for which future storms are compared to." Propst, the lawmaker, said he has lived through dozens of typhoons but "this is the first time I feared for my life." He, his wife and their four children huddled in a bedroom as the storm ripped storm shutters from the windows of his concrete home, shattered a glass sliding door and flooded the floors. Some poor families can't afford homes that conform to building codes, Propst said. Some build houses with concrete foundations and walls but that have wooden and tin roofs. "We're hoping for some clear skies and some sun so we can dry out," Propst said. "We want people to remember we are Americans and we exist."